What are risk factors for cataracts? What are causes of cataracts? What types of specialists treat cataracts? What are risks of the different types of cataract surgery? How long is the recovery after cataract surgery? What are complications of cataracts? What is the prognosis of cataracts? Is it possible to prevent cataracts? Where can people get more information on cataracts? Cataracts are extremely common, and most cataracts are a result of the aging process. Although many cataracts are not significant enough to require treatment, surgical removal of cataracts is usually safe and effective, resulting in improvement of vision. Cataract surgery should be performed when the visual loss from the cataract significantly impacts the lifestyle of the individual patient. Although vision can be restored in most people with cataracts, age-related cataracts are still the most common cause of blindness in the world, primarily because many third-world nations lack appropriate and available surgical services. As life span increases in the developed world due to modern technology and new methods of treatment of acute and chronic disease, the incidence of age-related cataracts will continue to increase. Cataracts can be classified by anatomical location within the lens, degree of clouding of the lens, or by the cause of the cataract. The lens of the human eye is shaped and sized similar to an M&M candy. It has a front (anterior) part and a back (posterior) part. The central portion of the lens is called the lens nucleus, and the outer portion is called the lens capsule. Between the inner nucleus and the outer capsule is a portion of the lens called the cortex. Clouding of the lens can occur only in the nucleus, in which case the term "nuclear cataract" or "nuclear sclerosis" is used. If the clouding occurs in the lens cortex only, the cataract is termed a "cortical cataract." If the loss of clarity of the lens is primarily in or adjacent to the capsule, the term "subcapsular cataract" is used. The location of the clouding can also be defined as being anterior or posterior, central, or peripheral. Often the clouding of the lens may affect multiple portions of the lens. The most common type of cataract that is related to age is sometimes termed a "senile cataract." This type of cataract primarily involves the nucleus of the lens. Cataracts that develop in the posterior subcapsular area (in the rear region of the lens capsule) are known as posterior subcapsular cataracts and are more common in younger age groups. Any degree of loss of the normal transparency of the lens is called a cataract. The cloudier the lens, the more advanced the degree of cataract. A cataract may be mild, moderate, or severe. It may be early or advanced. If the lens is totally opaque it is termed a "mature" cataract. Any cataract that is not opaque is therefore termed an "immature" cataract. Most mature cataracts are white in color. Advanced age is a significant risk factor for the development of cataracts. A family history for early development of cataracts, the presence of diabetes, tobacco use, and prolonged exposure to sunlight are also risk factors, as is trauma to the eye. The lens is made of mostly water and protein. 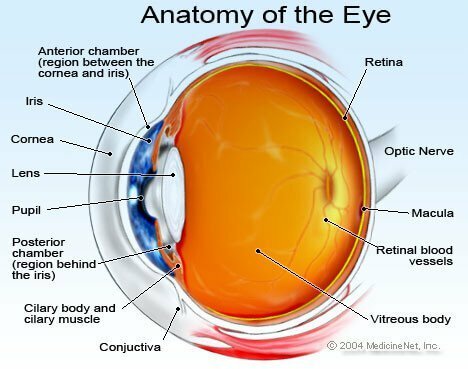 The protein is arranged in a specific way that keeps the lens clear and allows light to pass through it to focus a clear image onto the retinal surface. As we age, some of the protein may clump together and start to cloud a small area of the lens. This is our understanding of the cause of an age-related cataract. Over time, the cataract may become denser or cloud more area of the lens, making it more difficult to see through. A cataract is not a growth or tumor. There are many other causes of cataracts beyond advancing age. Whatever the cause, all cataracts are a result of similar changes to the protein of the lens, similarly resulting in visual blurring or visual loss. Blunt or penetrating injury to the eye may result in a cataract, either immediately after the injury or some weeks to years afterward. A cataract following an injury may appear and then not increase in density (be stationary) or be progressive. Eye surgery for other conditions can also cause cataracts. Excessive exposure to ionizing radiation (X-ray), infrared radiation (as in glass blowers), or ultraviolet radiation may also cause cataracts. Diabetes is associated with the development of cataracts. Inflammatory disease of the eye, such as iritis or uveitis, may cause or accelerate the development of cataract in the involved eye. There are many genetic illnesses that are associated with the development of cataracts. These include myotonic dystrophy, galactosemia, homocystinuria, Wilson's disease and Down syndrome, plus many others. Congenital infections with herpes simplex, rubella, toxoplasmosis, syphilis, and cytomegalic inclusion disease may also result in cataracts. There are many medications which, when taken over a long period of time, can cause secondary cataracts. The most common of these are oral corticosteroids, such as prednisone, which currently are used for a wide variety of medical conditions. The term "congenital cataract" is used when a baby is born with any clouding of the lens. This may be present in one or both eyes, be stationary or be progressive. Causes include genetic disorders or infectious or non-infectious intrauterine developmental disorders, both often associated with other physical abnormalities of the baby. Atopic dermatitis, other diseases of the skin and mucous membranes, hypothyroidism, and hyperparathyroidism are associated with the early development of cataracts. Patients who develop cataracts in both eyes at an early age often have family members who have also developed cataracts prematurely, implying a genetic cause, even in the absence of a recognized underlying disease. You may not notice any symptoms with early cataracts. As a cataract becomes more advanced, decrease in clarity of vision, not fully correctable with glasses, is noticed. There is a loss of contrast sensitivity, so that shadows and color vision are less vivid. Disturbing glare may be noted as light is into the eye scattered by the cataract. Haloes may be observed around lights. Night vision will be diminished. In certain types of cataracts, double vision may be noted in the affected eye. Some patients note that they require frequent changes in their eyeglass or contact lens prescriptions and may be aware that their near vision is improving as their distance vision declines. Family members of a person affected by cataracts in both eyes may notice that he or she appears not to be seeing as well as previously. The eye will appear normal to the untrained observer, unless the cataract is mature and white. In that situation, the pupil of the eye, which normally appears black, will look grey or white to the observer. The examining physician will find diminished visual acuity in the affected eye or eyes. This visual loss is not fully corrected by a change in the glasses. The lens of the eye can be easily examined by an ophthalmologist and the changes in the lens characteristic of cataract can actually be seen using a slit lamp, which is an illuminating and magnifying device used to painlessly examine the structures within the front of the eye, including the lens. Ophthalmologists are medical doctors who have specialized in the diagnosis and medical and surgical treatment of eye disease. Ophthalmologists both diagnose cataracts and surgically remove cataracts when indicated. Cataracts are relatively simple to diagnose by an ophthalmologist or an optometrist during a routine eye examination. It is important, when making the diagnosis of cataract, to also examine the entire eye for evidence of any other eye disease which may be compromising the vision. In addition to taking a medical and ocular history and visual acuity test, the ophthalmologist will check eye movements and pupillary responses, measure the pressure inside the eyes and examine the both front and back of the eyes after the pupils have been dilated with drops. People with early cataract will find that changing their glasses, using sunglasses to decrease glare and having better lighting to read can significantly alleviate their symptoms. Magnifying lenses for close work and reading fine print may also be helpful. Patients' responses to the presence of a cataract vary. A cataract in only one eye may be disturbing to a particular patient and may not cause significant symptoms in another patient. Cataracts usually do not harm your eye, so you can have surgery when it is convenient for you and when the vision loss from the cataract interferes with your daily activities. Once you understand the benefits and risks of surgery, you can make an informed decision about whether cataract surgery is right for you. In most cases, delaying cataract surgery will not cause long-term damage to your eye or make the surgery more difficult. If the eye has other diseases that have caused visual loss such as glaucoma, macular degeneration, diabetic retinopathy, or optic nerve damage from glaucoma or other disease, cataract surgery may not improve the vision. Occasionally, your doctor may recommend removal of a cataract if it prevents the diagnosis or treatment of another eye problem, such as macular degeneration or diabetic retinopathy. If both eyes have cataracts and surgery is agreed upon, the surgery on the second eye is generally planned at least a week after the first eye. There is usually no harm in waiting a much longer period of time between the two eye operations. Because the lens of the eye is necessary to accurately focus light onto the retinal surface and removal of the cataract involves removal of the lens, modern cataract surgery combines removal of the lens and placement of a new artificial lens into the eye. Measurements for the size, shape, and power of this lens will be taken prior to the surgery so that the specific lens can be available for implantation at the time of surgery. Cataract surgery typically involves implantation of a monofocal intraocular lens, which has a fixed focus at a predetermined distance. In general, the focus is placed at distance and a reading glass is required to see up close. Multifocal intraocular lenses are also frequently implanted. Benefits and risks of these should be discussed with your ophthalmologists. More than 3 million cataract surgeries are performed annually in the United States. Cataract surgery is extremely safe and effective, improving vision in the vast majority of patients. Cataract surgery is usually performed as an outpatient procedure under local anesthesia. Some sedation is ordinarily given intravenously just before the beginning of the surgery, which usually takes under a half-hour. Most cataract surgery today is done through a small incision by phaco-emulsification (phacoemulsification) or by other means through a slightly larger incision. In more than 95% of cases, a new lens, known as a lens implant or intraocular lens is inserted at the same time as the cataract removal. You will not feel the new lens within the eye. Most patients need to limit their activities for only a few days and recovery time is brief. Although modern techniques have made cataract surgery quite safe, complications can occur with any surgical procedure, including cataract extraction. These include hemorrhage, infection, loss of a portion of the cataract into the eye, displacement of the intraocular lens, glaucoma, and retinal detachment. Fortunately, all these complications are rare and usually can be managed. Blindness is a rare complication of cataract surgery. Modern cataract surgery involves leaving a portion of the lens capsule within the eye to support the intraocular lens. This capsule may become cloudy at a later time, necessitating opening of the capsule through the use of a laser. This outpatient procedure is called a YAG laser capsulotomy. It is painless and rarely results in increased eye pressure or other eye problems. Occasionally, a very dense cataract of long-standing duration may enlarge in size and interfere with fluid drainage within the eye. In addition, a far advanced cataract may leak protein into the eye, causing inflammation of the eye. Your doctor will advise you of these possibilities and may recommend surgery to avoid these complications even if the decrease in vision is not bothering you. The presence of a cataract may make evaluation of diseases of the retina more difficult, since the physician must look through the cataract to examine the retina. The rate of progression of cataracts is usually predictable and surgery is successful in restoring vision in a large majority of cases. If other diseases are present within the eye, the degree of visual improvement will be limited by the other disease process. Ophthalmologists can usually determine this in advance. Everyone, if they live long enough, will develop cataracts. There is no scientifically proven method that prevents the inevitable. Progression of cataracts can be slowed by avoiding large amounts of ultraviolet light, not smoking, avoiding trauma to either eye, and following a healthy diet. Wearing UV-protection sunglasses when exposed to sunlight can be helpful. Asbell, P.A., I. Dualan, J. Mindel, et al. "Age-related cataract." Lancet 365 (2005): 599. Congdon, N., J.R. Vingerling, B.E. Klein, et al. "Prevalence of cataract and pseudophakia/aphakia among adults in the United States." Arch Ophthalmol 122 (2004): 487. Lai, F.H., J.Y. Lok, P.P. Chow, and A.L. Young. "Clinical outcomes of cataract surgery in very elderly adults." J Am Geriatr Soc 62 (2014): 165. Mares, J.A., R. Voland, R. Adler, et al. "Healthy diets and the subsequent prevalence of nuclear cataract in women." Arch Ophthalmol 128 (2010): 738. United States. National Eye Institute. National Institutes of Health. "Facts About Cataract." Feb. 2010. <http://www.nei.nih.gov/health/cataract/cataract_facts.asp>.